Amanda Caldwell: My poetry book is published! 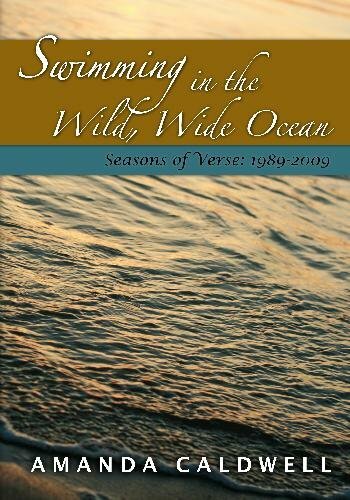 My NaNoWriMo success gave me a free proof copy of a self-published book through CreateSpace, so I've published a collection of my poetry, Swimming in the Wild, Wide Ocean, Seasons of Verse: 1989-2009. Yes, I had to dig through boxes in storage and old journals to get back that far! I nixed quite a few deliciously atrocious poems, and I trust that what's left is a good sampling of my thoughts, prayers, and creativity over the years. Courtney gave me the idea to arrange the poems according to season, one complete year from summer to summer. Steve worked hard designing the cover and proofing for me. Buy it here at CreateSpace or here through Amazon . My understanding is that standard shipping is cheaper through CreateSpace unless you're buying enough at Amazon to qualify for the free Super Saver Shipping. CreateSpace is print-on-demand publishing, so they'll print up as many as you want. So don't be afraid to buy a caseload! Or, you know, just read some poetry on here for free. Wait, I'm a terrible salesperson. Congratulations, Amanda! How exciting--I can't wait to see it in person and read all your poetry. We'll have to swap stories on the publication process so I can decide if I want to try out CreateSpace for my next book. And I suppose, since you did give me credit for my idea, I won't demand a cut of your royalties :o).